Spaceflight Now | Breaking News | After the gold rush on Earth a 'Helium rush' to the Moon? After the gold rush on Earth a 'Helium rush' to the Moon? Even a Belgian mineral water 'SPA' has contributed to the lively discussions at the Noordwijk lunar conference. "No need to search for water in the South Pole Aitken basin, when we already have it here!" joked one participant. For the two days last week, the 4th International Conference on Exploration and Utilisation of the Moon (ICEUM4) has been working in three splinter sessions devoted to 'Science of, from and on the Moon', 'Technology Demonstration, Utilisation of Lunar Resources and Environment' and 'Infrastructure Development and Lunar Role in Human Expansion in the Solar System'. The numerous oral presentations have given rise to detailed discussions on all aspects of future lunar exploration: the Moon as an astromical platform, the effects of undiscerned craters on travelling rovers, whether water-ice might be detected by forthcoming missions, the architecture (inflatable or otherwise) of lunar habitats, what would be needed for the Moon to support life, the scientific motivations for returning to the Moon. One subject illustrated how valuable the Moon could be to satisfy Earth's energetic needs. The 3He isotope ("Helium 3") present in the Moon's regolith just below the surface of its maria is considered to be the only resource worth extracting and bringing to Earth - more valuable than, gold, diamonds or even enriched uranium! Quantities of Helium 3 on the Moon are worth about 3 Billion US$ a tonne at todays' oil prices. The only terrestrial Helium 3 is some 200 kg result of the decay of tritium in thermo-nuclear weapons. It has been calculated that the Moon has enormous reserves of 3He in the order of one million metric tonnes. Energy needs on Earth are expected to increase two to three times by 2050. Helium 3 could be used in fusion reactors producing 'clean' electricity, with little or no radioactive waste, unlike present nuclear reactors. Second generation fusion reactors, using 3He and Deuterium, give rise to far fewer neutrons, at the source of radioactive waste and radiation damage. Third-generation fusion, in which Deuterium is replaced with a 3He-3He reaction produces no neutrons whatsoever. Scientists at the Fusion Technology Institute of the University of Winsconsin-Madison believe that the physics of this proposal have been demonstrated. In the last two years, they have had operated a facility (an inertial electrostatic confinement device, IEC) functioning with Deuterium and 3He. The device functioning experimentally actually consumes more energy than it generates, but is already useful to produce medical isotopes, required in positron emission tomography (PET). These isotopes allow doctors to map certain organs or abnormalities such as cancers. But the IEC fusion facility also opens up the prospect of producing electrical power on a massive scale: 10�000 MW-years with but one tonne of Helium 3. Compact fusion devices using Helium 3 can be envisaged for space propulsion capable of generating enormous acceleration. The remaining requirement is to obtain a supply of 3He. 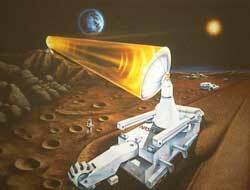 Studies have shown that a 20 Ton lunar mining machine, brought to the Moon in parts and assembled there could collect the regolith and using solar energy extract the 3He which could then be ferried to Earth. By-products of the extraction would include hydrogen, water, nitrogen, methane, all extremely valuable life support elements for lunar colonies. Would this mining operation disfigure the face of the Moon or contaminate its environment? According to the 3He advocates, its effects would be invisible from Earth, with excavated crater areas being simply smoothed out.